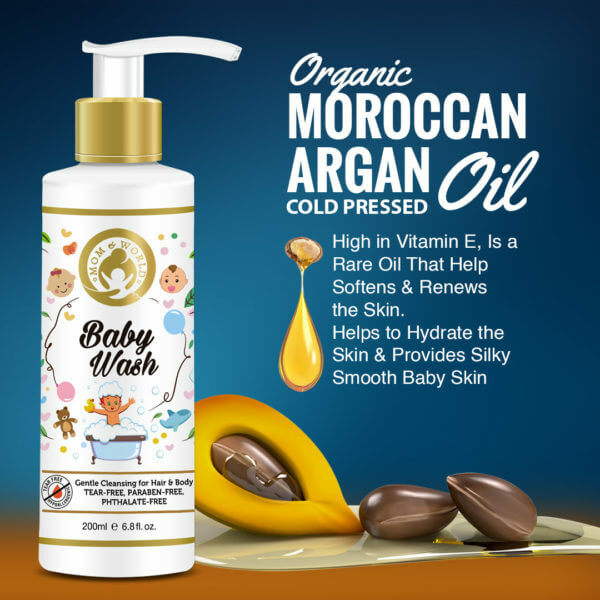 Mom & World Baby Wash gives your baby a calm and comforting bath by gently cleansing the skin and moisturizing it to bring out your little one’s baby-glow. 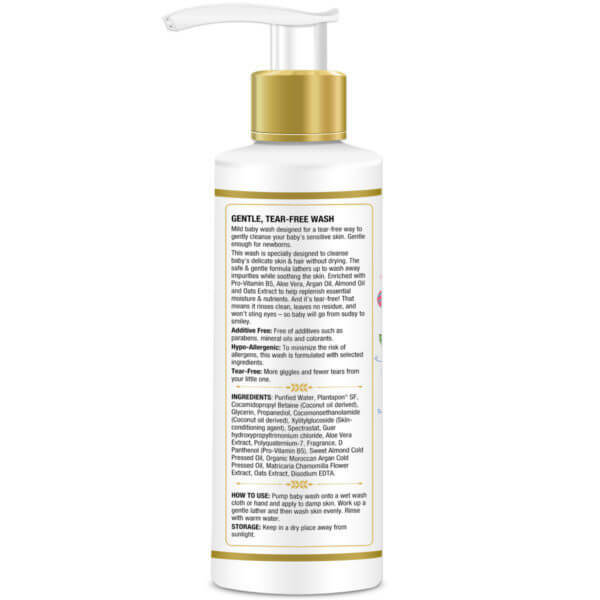 This Product blends the skin benefiting qualities of natural oils and extracts in a safe and gentle formula to wash away impurities and soothe the delicate skin. Moroccan Argan Oil softens and renews the skin, while Pro-Vitamin B5 helps replenish essential nutrients to it. All the oils are cold-pressed and therefore perfectly safe for your little one’s sensitive skin. 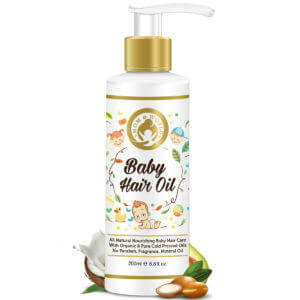 The vitamin-rich Sweet Almond Oil nourishes the baby’s skin. The extracts of Aloe Vera, Chamomile Flower, and Oats add the moisturizing and soothing effect. The ingredients work synergistically to help clean, protect, smoothen, and soften your baby’s skin and hair. Special care has been taken to avoid any harmful ingredients in this product. This baby wash is tear-free, which means it rinses clean without leaving any residue or stinging your baby’s eyes. 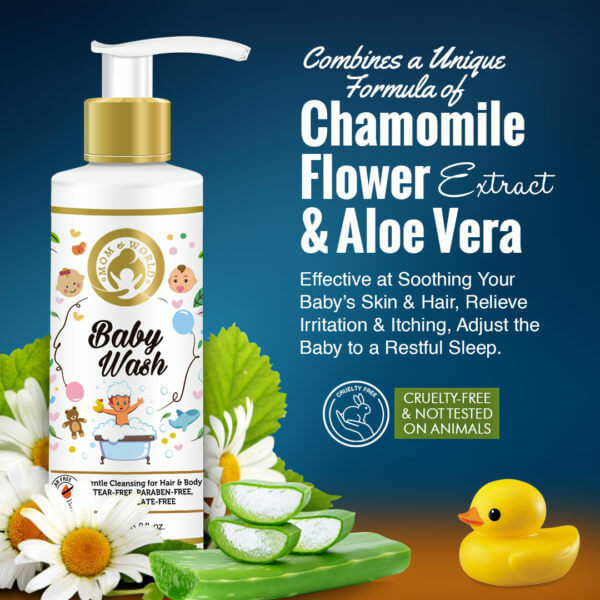 So use it with confidence to give your baby a refreshing, healthy bath. The ingredients in Mom & World Baby Wash 200ml clean and nourish not just your baby’s skin, but hair as well. Sweet Almond Oil contains vitamins A, B1, B2 and B6. It is versatile oil which is mild, well-tolerated, and therefore suitable for all skin types, including the delicate skin of babies. What makes Almond Oil an ideal cosmetic ingredient is its ability to get easily absorbed into the skin and help other ingredients to reach the deeper layers . Oat is so good for sensitive skin that its starch is often used in baby powders and deodorants to replace baby talc. Oat not just soothes delicate skin, it moisturizes it, relieves itching, irritation, and inflammation . Oat is also a potent soap-free cleanser. It contains a colloid that has a soothing effect on the skin. It leaves a smooth after-feel and is often recommended by dermatologists for irritated or allergic skin . 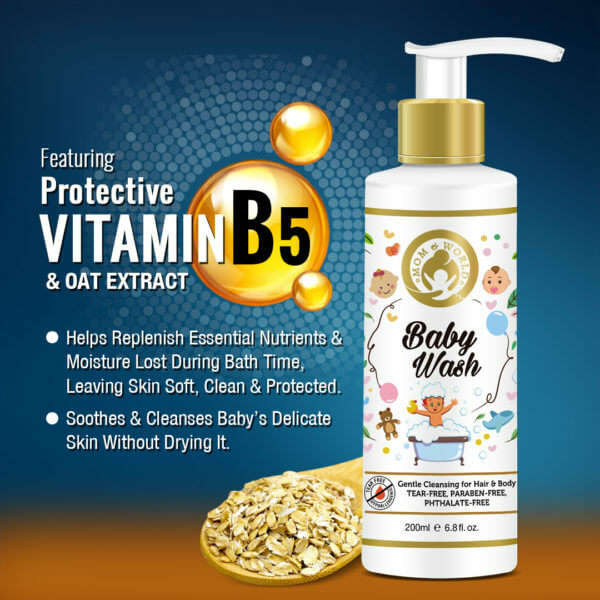 HOW SAFE IS MOM & WORLD BABY WASH FOR BABIES? 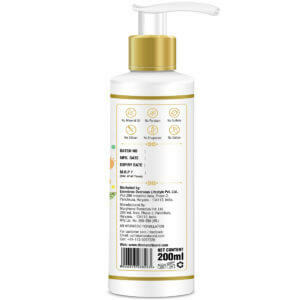 Mom & World Baby Wash 200ml is completely safe for your baby. 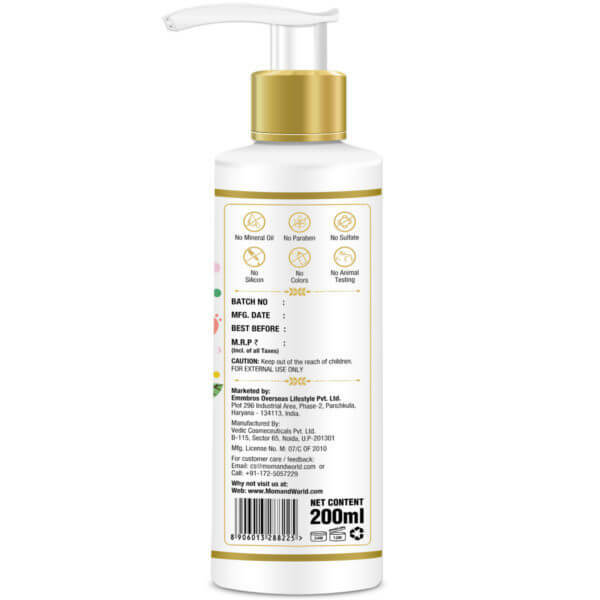 It is free of additives such as parabens, phthalates, mineral oils, and colorants. It is a hypo-allergenic product, which means the ingredients in it are not likely to give your little one any allergy. All the oils used in this baby-wash are extracted using the cold-pressing technique in which the purity of the nutrients is retained without adding any chemicals or bleaches. 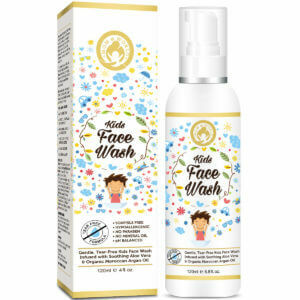 It is a mild baby-wash designed to gently cleanse your baby’s skin. This product is for external use only. Though it is for babies, you must keep it out of reach of your little one. Aloe Vera Extract, D Panthenol (Pro-Vitamin B5), Sweet Almond Cold Pressed Oil, Organic Moroccan Argan Cold Pressed Oil, Matricaria Chamomilla Flower Extract, Oats Extract. Pump the baby-wash onto your hand or wet washcloth and apply it evenly to the skin of your baby. Gently work up lather and then wash it well with lukewarm water. Nice body wash for my little one. It gently cleans without harming the skin. 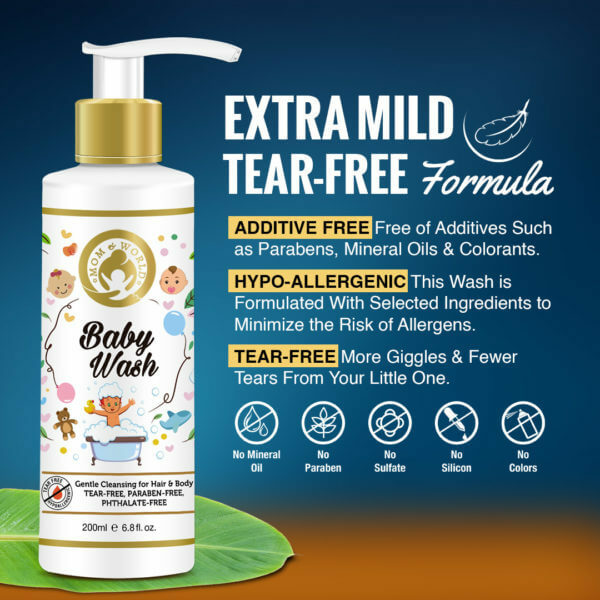 A tear-free cleanser perfect for the baby skin. This is a gentle and safe cleanser. My little one’s skin stays hydrated after wash.